The ability to personalize our Treo always appears to be at the very top of our needs and it should therefore not be surprising that a Treo ringtone player such as Ringo Pro has shot to the very top of the best selling applications charts. At its most basic Ringo allows you to set any MP3 on your SD card as a ringtone – the standard “Sound & Alerts” Prefs only allows for MID, AMR or WAV files. 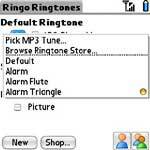 However, it is the range of ringtone customization that sets Ringo apart. There are three levels of changes that can be made for 1) all calls; 2) specific individual calls and 3) groups of callers. 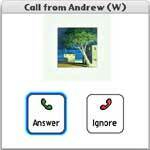 Each of these levels then further allows the customization of the 1) ring tone; 2) SMS tone and 3) picture display. Additionally, if you have 3MB to spare on your Treo, you can also install EPSpeak which will add spoken call announcements to let you know who is calling. The second level, Ringo Friends, is accessed by pressing the single head icon at the bottom right. You can create a New friend either manually or by pressing Lookup which will access the Contacts database. Clicking ‘Match all numbers’ will ensure that all numbers listed under that contact use your selected Ring and SMS tones as well as a picture. 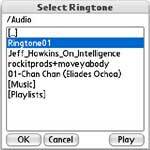 In this example below, I set a new Ringo Friend for myself with all numbers and as you can see (though not hear of course) everything worked as planned when I placed a test call to my Treo with the caller ID at the top, the picture showing and the MP3 that I had selected playing. The third level, Ringo Groups, allows you to set ringtone and picture preferences for the various categories in your Contacts (must use the default contacts database and not a third party application). 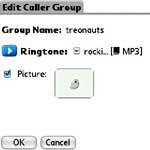 As before, in this example I set a separate ringtone and picture for my Treonauts contacts category and had the right changes show up when I placed a test call. Because Ringo uses the default Contacts database and also accesses the MP3 ringtones from the SD card you should be aware that third party PIM applications may cause conflicts. Also, if you receive a call and your SD card is not inserted you ‘may’ experience a soft reset. Some people have reported that their Treo 650 crashes or resets on incoming calls with Ringo installed and again this is likely due to software conflicts. Nevertheless, by and large most people appear to have no issues whatsoever and are happily using Ringo every day. The obvious practical aspect of Ringo is that it will allow you to, for example, set one default ringtone and image for all your business and a separate one for your personal calls with Ringo Groups, assign a specific ringtone and image to quickly identify your spouse or loved one (or even your boss) when they call or SMS with Ringo Friends and to leave all other ‘general’ calls with a distinct ringtone and image of its own. I only describe a few instances of customization but if you take the time then you could assign dozens of individual ringtones and pictures for groups and friends. I have to admit that wasn’t a particularly big fan of plain ringtones before but now that I’ve experienced and better understood the significantly higher level of personalization that Ringo Pro offers I have come to regard it as an important application that once more sets my Treo well apart from the rest. I tested several MP3 Ringers and chose mRing over Ringo Pro. 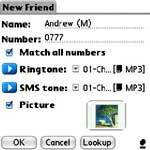 mRing does not use an external audio player for playing MP3 ringtones. This means my podcasts and audio books automatically start back up where they were at the end of the call. Also mRing will use the default ring setting in prefs if the SD card is not in the Treo. It doesnt do pictures and you can set the call ringtone for each contact to also play on SMS but you cannot set a different SMS ringtone than the call. I've tried a bunch and found myself going back to the built in tones as they are a whole lot more stable. what skin is that on your tre 650? Where can I download it? I really like Ringo but deinstalled it again! When using a headset and you receive a call it ONLY rings in the headset. The Treo does not ring. ==>I missed so many calls because in car I have the headset plugged but do not have the headset in the ear all the time. I purchased Ringo Pro from Treonauts and while my whole purchasing experience (and subsequent return/refund experience) was SPECTACULAR, I found Ringo Pro to be a TERRIBLE program. My coworker and I both bought it and NEED that funcionality. It caused both our phones to reboot constantly and randomly on incoming calls, sms', etc. I can't even begin to say how much I hated it. I am looking for the same function but with that whole "working" thing going for it, so I will give Mring a try. To be fair, this is also rated as the number 1 ringtone manager, so who knows. If anyone out there has suggestions of STABLE ringtone managers that allow MP3 ringtones you make yourself, THAT'S what I need! 1. it doesn't play ogg files. no way to describe how important it is. 2. it copies selected files to RAM which eats up memory space. my alternative is treoguard, which does its work without ny fuss at all. and for sms ring... phone technician. and those looking for ringo's functions (like picture ID) and MUCH MORE, its 'lightwav'. Thanks for the feedback! As I mention in the post some people like Geo have had significant issues using Ringo while others have not. Makrotonik - I am currently evaluating a MacOSX skin called PalmRevolt http://3gxsoft.com/palmrevolt While I really like it, please note that it is _not_ yet fully functional on our Treo but I am working with the developer to sort this out. I'm a PhoneTechnician fan myself, it's more than just a ringer, and doesn't require a thirdparty mp3 player, it's made by hobbyist.com...! No problem, and let me say again that the purchases I have made on this site have been GREAT and when I had this one bad piece of software, the return/exchange efforts by Treonauts and the software store were absolutely fantastic. Before I dealt with them, I unfortunately dealt with the developer and they were AWFUL. After dealing with the developer it made Treonauts shine that much more when they actually stepped right up and helped me above and beyond! Am I the only one that thinks 'Ringo'-type functionality should be just be included on the Treo by default? I demo'd Ringo for a while, it worked fine, but in the end I couldn't justify shelling out the $30 for the functionality it provides. I agree...I used to use the Kyocera 7135 and all this and more was included out of the box. I miss that. However, Myself, and the other techs at my company, use our treos as a "support pager" so to speak for work...so we REALLY need this functionality to distinguish between work related calls and personal. Also allows us to distinguish between types of work calls as well. Lastly, the demo of Ringo worked FLAWLESS...but it only allows one user....it wasn't until we gladly plunked down the cash that we found out it doesn't work beyond that. I'm going to try out mring...it's a measley $13! Basically you convert the tones using a free Nokia application to the AMR format, then email to yourself (apparently bluetooth will work as well). The new ringtones appear alongside the built-ins. When I installed ringo on a gsm treo I found that the treo would reset when I turned on the phone and there was a voicemail waiting for me. I went into the pref screen and shut off all tones in the built in software. That seemed to eliminate the conflicts. Now I like the ringo software and find it very useful. I'm hoping to get a treo that I can play music in the car with. Do you have any recommendations for the best adapter to play the treo mp3's on? does a tape cassette version work better than the radio frequency one, etc? please let me know. Thanks, I love your comments. I've tried Ringo Pro and mRing and found that both do not work correctly if you have 'Good' installed on the Treo 650. Even with a duplicate contact in the local contacts, they do not use see the contact. They just play the default ringtone. 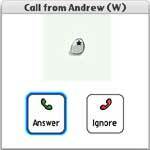 I have also found that if you are using speed-dial they use the speed dial ring tone instead. 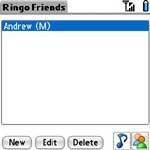 I'm using Ringo Basic on my Treo 600 and I can't seem to get the Friends and Groups settings I have configured to work. The Treo seems to always ring w/ no pic and the Default Ringtone and SMS tone. Why is this overriding my Friends and Groups settings??? Can anyone help me with what must seem a stupid question? I am new to my Treo 650 and the whole ringtone miasma ... but I found a ringtone on a web site that I love. I have no idea how to make my Treo 650 use this tone or, for that matter, even get the thing onto the phone itself. I've downloaded the WAV. file to my desktop. I can play it on my computer w/Media Player. Now how do I get the sound onto my phone and make Treo use it as my default tone? Do I need a specific program like Ringo or something else? I have a card thingie with plenty of space on it in my phone. I just wish there were someone out there who could take a newbie through the appropriate staeps to do this. OK, so I am trying to figure out how to do this for the 600... [vs. the 650]. Does the 600 use any file types other then midi? Is there a way to convert a full audio track into midi? Does anyone know how to fix the sound on the treo 600 I tried everything my ringers don't work it only vibrates i've looked at the manual online and tried changing the settings but it still does not work. The mute button on the top of the treo is loose can that be the problem? if so does anyone know how to fix it? yelp ringo pro is a lousy program it does not works on the treo 680 after the latest updates! I have tried Ringo Pro and Phone Technician, but at the end I went back to the built in ringtone. All becoz these 3rd party softwares caused a huge lag in the ringing session - ie. when there's an incoming call, the vibrate mode and the screen turns on, but about 5 seconds later, only the tune (mp3) will come on! 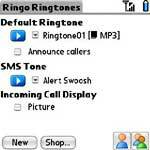 Has anyone resolved the silent ringtone issue that plagues some Treo users? I don't know if it is because of Ringo, but I have yet to find a solution. Thanks.